Create a real world medieval setting or your make up your own history with a toy castle at the centre of your young knights play. Considerable educational value as they will learn about medieval times as they develop ideas for creating battles and historic scenes. 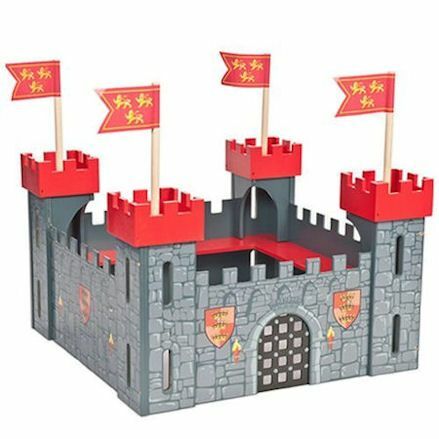 Otherwise, they can enjoy the toy castles just as they are, with plenty of compartments and rooftops to battle enemy knights and fight off incoming armies. 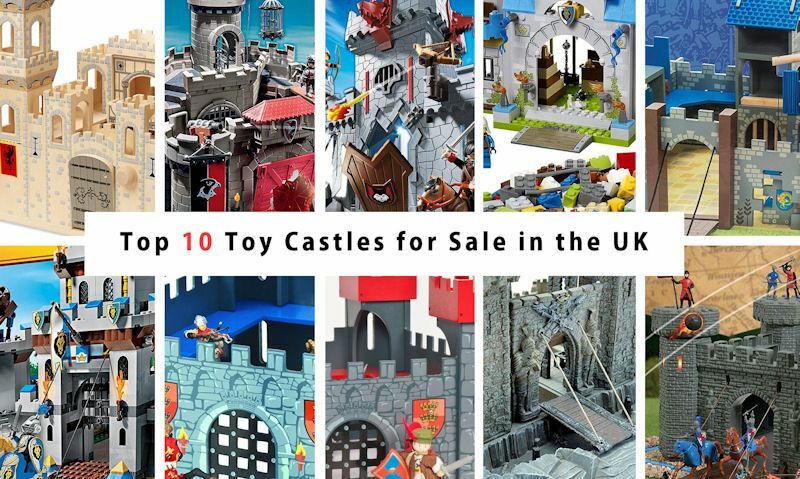 Our top ten list includes toy castles for sale in the UK in 2019, well some items might become unavailable, pop back as we update the recommended place to buy. 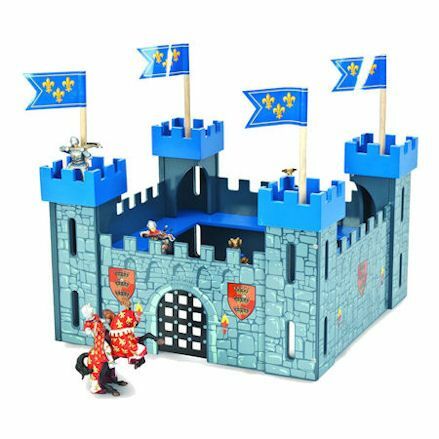 If you need a wooden toy castle to fit your favourite knights then there's no other than this Melissa and Doug Folding Medieval Castle, perfectly suited for knights from Papo, Playmobil, Schleich and Plastoy. But these are mid to large size knight figures, so if you choose a range of figures in a smaller size then not only will they still fit well with the set, but create a more spacious area inside the yard - with room for battles or a living area. 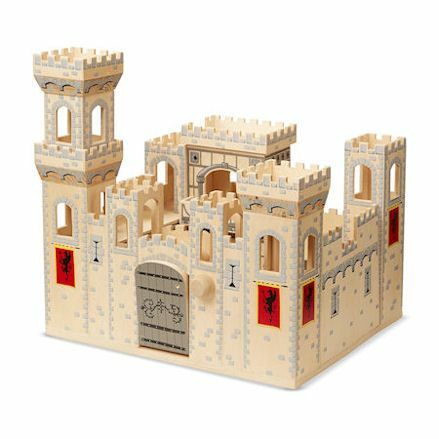 To be precise, this wooden toy castle is made from birch face plywood with a metal hinge - and needs no assembly. A few of the towers can be moved around to make a new setting well still maintaining a beautiful looking castle. Well obviously machined made, it's also painted using a printed method but still looks like it was hand painted. Everything you need to get your Playmobil castle up and running straight out of the box. 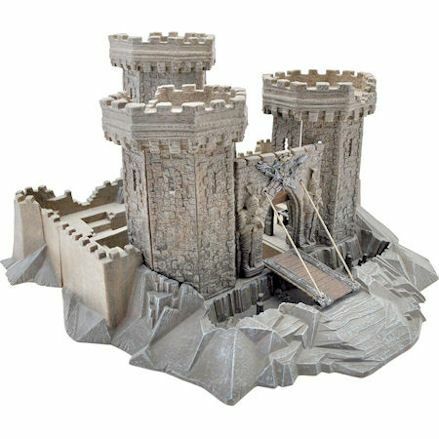 This castle playset includes up to 28 pieces in the kit that includes the castle when assembled. The castle is fitted with 3 towers, a draw bridge, courtyard and high walkways for standing guard. To protect the Playmobil castle from attacking enemies it comes with 2 knights and one on horse back with lots of medieval weaponry for battle. If you take any prisoners then keep them in the dungeon or in the hanging cage lifted with help of a winch. Also featured is a flag, ladder and cannon to keep at bay a fall scale assault on the castle. Third place is this Playmobil ‘Take Along' Black Baron's Castle with a setting based on protecting a chest full of treasure from an attack on the castle. Because this set can be folded up for transportation the set is mostly just a front with no walls sitting around it with a yard in the middle. Instead, all action takes part at the front of the castle. But the castle is not without interesting features; like the opening drawbridge gate and trap door. But it does come as a near complete set with 3 knights - one for horse back - lots of weapons and the treasure trove with lots of gold coins. At under 30 quid, this one is not a bad investment for a first castle. 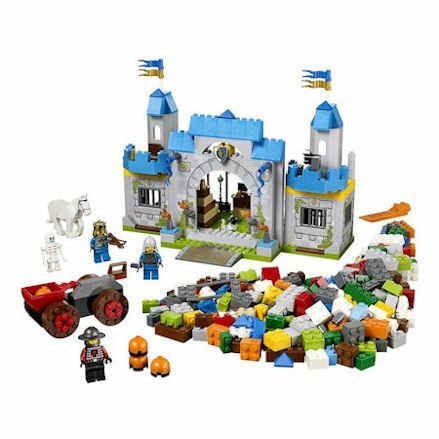 A list won't be complete without a Lego set featured, and this one has it all including;a fronted stone effect wall with two main watch towers and a large main gate with a ramp leading to the courtyard. Colourfully made with blue stand out pieces, grey brick effects, green base representing grass and ivy climbing the walls. As the black knight is trying to steel the treasure, your knights job is to protect it within the castle boundaries. Lego pieces included are a horse and carriage, knight figures, skeleton, treasure trove and lots of extra bricks. A fantastic Lego start set for kids 3 years and up with lots of accessories. 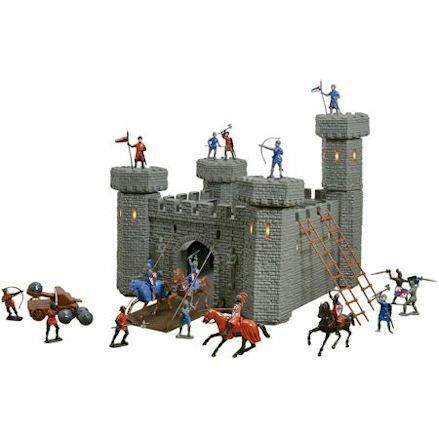 Well all animals, figures and play mat are not available with this play set, you can get off to a good start by using knight figures by Papo or Schleich, which match the size of this castle perfectly. 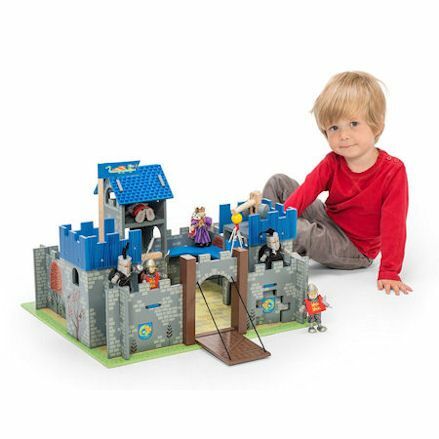 What is included is a walled wooden toy castle with three towers and walkways, a working draw bridge and winch. Self assembly is needed when unboxing this set with a simple slot together design and then it's screwed tight. Just remember to buy this castle with knights and accessories sold separately. Le Toy Van recommend Budkins characters, but they are a little to young for 3 years and up, go for realistic Schleich and Papo knights. Incredibly detailed Lego King's Castle with a huge array of accessories and a castle riddled with bits and pieces and remarkable features. This includes three high watch towers fixed with weapons or platforms and secondary walk ways for battling armies outside the walls - also comes with a working draw bridge. Well that isn't enough the the wall collapses for when creating battle scenes. And there are plenty more features to enjoy in the shape of knight figures, horse and accessories with major weaponry included. These are battering rams and catapults that are used by incoming armies who are trying to gain access to the castle. Stunning, made from MDF Le Toy Van castle in a blue setting and printed wall effect with lots of little detail. 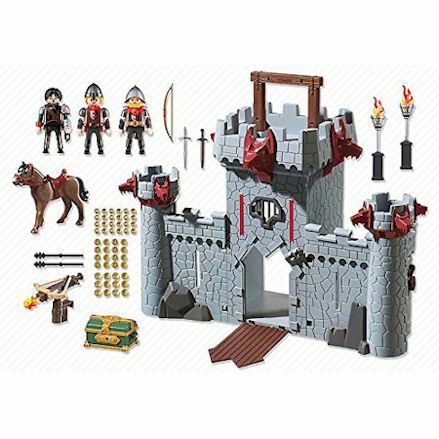 Well you need to buy the knights and accessories separately (we recommend Schleich or Papo figures) included are; castle entrance wall, running board, tower support and tops, flags, portcullis (gate) and steel screws. Populate this castle with knight figures that can freely move under the gate with a lifting up action. You can then position them on the four watch towers to keep on eye out for the enemy approaching and platforms to move from tower to tower. If the enemy attacks, make sure every one is nice and secure in the main courtyard. This one is exactly the same as the Le Toy Van castle above, but is finished in a striking red. And as you would expect, is featured with all the odd-cons including walls, towers, lifting up main gate, flats and a spacious courtyard for battling the enemy or where the knights and villagers come to visit. This Le Toy Van castle is ideally suited to Schleich or Papo knight figures, but if prefer knights with a friendly look and feel, try the Budkins characters. This castle is self assembled with screws included. And again you only get the castle and associated fixtures, with no figures and accessories included. Highly detailed plastic moulded castle made to look incredibly real with lots of details and fixtures. 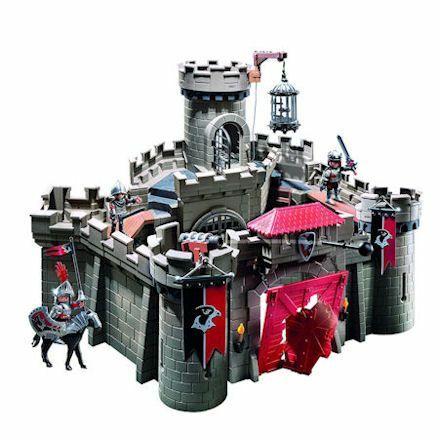 Once assembled by fixing the tower walls together and positioning on the base, you'll have a plastic toy castle suited to knight figures that are smaller than Schleich and Papo, so go for figures and accessories in bags that can be bought separately. A castle based on a hill with a working draw bridge is the only access to the castle, but if enemies attack they will climb the walls so you have to protect it at all costs. Once you've sorted out what knights to use, then think about battering rams and catapults for the enemy, and knights and horses for the good guys - comes with red dragon. 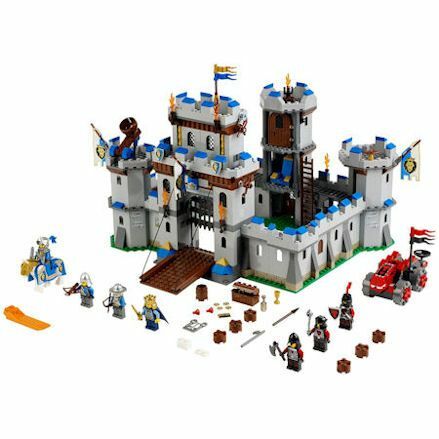 Wow, a good starter plastic toy castle at a low price, with all the knight figures, horses and accessories you can possibly need. This saves you the time of looking for figures sold separately and avoiding a head arch for knights that are the right size. Everything you need to get and up and running is featured right out of the box. This is a four sided high wall castle with four watch towers, firing cannon balls, 2 ladders, 10 knight figures and 4 horses with riders. Well the enemy will try and gain access using the ladders on the walls, protect the castle by repelling the enemy from the height advantage using your hand held weaponry.